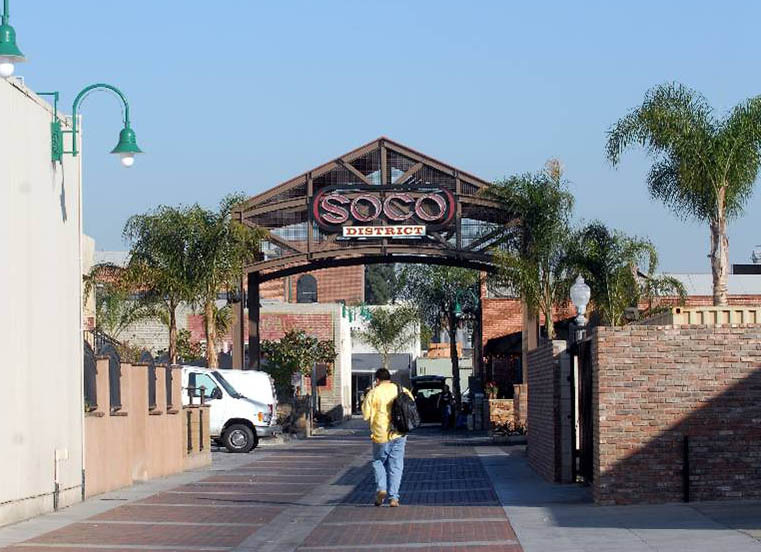 Fullerton's SOCO (south of Commonwealth) District, once a neglected area of the city, was redeveloped into a thriving center of business, residential, and entertainment activity. Fullerton, California, (population 130,000) is located in the southern part of the state in Orange County. The community dates back to 1887, when two brothers from Massachusetts–George and Edward Amerige–were duck hunting in the area and decided to develop a town. The city’s future was secured when the Amerige brothers were able to convince George H. Fullerton, president of the land and development arm of the Santa Fe Railroad, to route the railroad through the fledgling town site. The discovery of oil in the 1890s and the development of a booming citrus industry led the city to economic prosperity. Fullerton continued to grow and now boasts two museums, a cultural center, five colleges and universities, 50 city parks, recreational trails, two golf courses, and an arboretum. Fullerton has preserved many of its historic buildings and a number are listed on the National Register of Historic Places. A downtown walking tour takes visitors past such treasures as the Spanish Colonial Revival-style public library, built in 1941; the 1930 Santa Fe Depot; the relocated Union Pacific Depot, completed in 1923 and a major example of Mission Revival architecture; and the Amerige block of commercial buildings built in 1920, each with a glazed tile façade. The city recently redeveloped the SOCO (south of Commonwealth) District, which has turned a once-neglected area of the city into a thriving center of business, residential, and entertainment activity. Every May Fullerton celebrates Railroad Days, featuring model railroads and historic railcars, cabooses, and lounge cars open to the public. Fullerton’s annual New Year’s Eve Party, “Fullerton First Night,” and the yearly “A Night in Fullerton,” which offers free music, art, and dance programs, attract residents and visitors to the city’s historic downtown.